Been experiencing very degraded speed today and yesterday. Latency seems ok, only getting about 2mbs instead of 10mbs. Is anyone on sonic wireless gaming on the Xbox one? If yes, could you please tell me what router and equipment they installed? Please do a multiplayer test on the Xbox as well. Reason, I am currently with a wisp and they cannot help me get the port forwarding right for my xbox. I cannot play any multiplayer formats. I am locked out of the Mikrotik router which was supplied, so I cannot troubleshoot from that end. Did the multiplayer test and it cannot find the Teredo IP. Did the necessary troubleshooting with no luck. I am at my wits end here, it use to work perfectly, now it's gone pear shape. I just game and download updates/games on the wireless link. As of the 29th, I've been getting what looks like terrible routing and speeds to google services. This prevents youtube from loading correctly, it hangs on google's various content delivery addresses. Since 99.9% of websites use some google service, in particular analytics, this causes lots of websites and apps to load very slowly as well. Otherwise everything seems fine, getting full speed locally and internationally. I know they recently said they did some routing optimization at Teraco, 27th if I'm not mistaken, I suspect this is the problem. So it seems the network issues were resolved, probably sooner than I thought. Everything was breaking across my various devices because they had corrupt google js files cached (incomplete files to be specific) from the network "blip", after clearing them across the devices, everything back to normal. I've been getting regular performance drops in the evenings for the last couple of weeks on week days. Weekends and after hours during the week it's awesome. For example yesterday YouTube defaults to 1080p60fps and buffers upwards of 8000kbps. Right now no video will go over 600kbps. I'll open a ticket once I've collected my evidence... Is this happening to anyone else? Sounds like interference or congestion in those hours. Give them a call while it's happening, they are normally quite good at sorting stuff like that out within a few minutes. moved to Melkbosstrand 2 months ago and having heard of the major issues with Telkom we decided to try both. I have run them both for comparison. Telkom is terrible (I expected this) but for the past 10 days international has been even worse with Sonic. The supposed 4 Meg I paid for with telkom is less than a 2 meg line (fault reported and obviously still open) but I only ask the question here as no person has responded from Sonic with a solution. I've had 1 written waffly email response but It's been 4 phone calls and 3 emails and it is still poor. anybody else in this area having problems?Just to add, we are on the 5 Mbps uncapped packaged and International Latency appears fine but download speeds are running at less than 1.5Mbps. Telkom in Grotto Bay on Copper was far superior to this (and they're now getting fibre)??? I'm currently looking into getting a 10mbps uncapped package with them and that's fairly worrying to read - has anyone else noticed similar performance issues? Would like to steer clear if it's a general issue on their network. Also consider getting Sonic Wireless after ditching ADSL, but also a bit cautious since going through this thread as it's quite an expense to get started with the installation costs and you never get to own the equipment so if its a sub-par experience it will be an expensive mistake. The alternatives don't seem to be particularly anything to write home about either. Currently still fiddling around with mobile 3G/4G options as a stopgap until fibre is more widely available in our area which still looks like the best long term investment. I'm also on the 5mbps package, and recently have been averaging between 50kbps-80kbps downloads, with peaks of around 400kbps (around midnight). Previously I had a steady 350-450kbps download stream. They did send a mail that international was affected, and resolved. But Im still not getting anywhere near the 550kbps peaks I hit a few months ago. Not the most promising start (screenshots also don't show the amount of jitter present), but apparently it is a new node and there could be some teething trouble initially. Have been impressed by the level of service and the quality of the installation so far, but it's the connection quality that counts. I took them up on a 7-day trial for the 10mbps home uncapped package. 1. After 6pm at night, the speed seems to taper down - sometimes dropping to 5-7mbps. I've also had drops to 3mbps, but that was only for about 15mins at at time. It seems to pick back up at 9pm to 10mbps. 2. 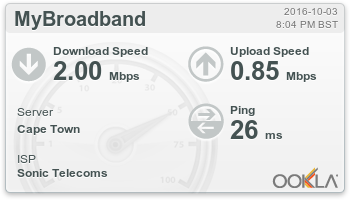 The latency is fairly good, but I have been experiencing some jitter - my ping to bbc.co.uk seems to fluctuate from 155-220ms. To give credit where it's due - the connection is rock solid during the day and even with that amount of jitter, online gaming is no problem. They've been in contact with me about the above 2 issues and have made some changes to my link that I'll be testing out tonight - looks like the jitter has improved and I'll have to test tonight to see about the speed. I'm in the Blouberg area, so I'm probably connecting to a different highsite Jonty97 - here's to hoping that they can sort out your problems. After the issues continued yesterday, I phoned Sonic Wireless support and they spent a lot of time ironing out some of the issues on our connection last evening. Excellent and friendly technical support on their side and was a pleasure to deal with them. Connection is looking much better now and will post updates soon, but speed is generally now close to 5mbps as it should be and the latency is very good. Any SonicWireless users out in Stellenbosch? Whilst the support is polite, I find it difficult to believe that I am the only individual in MelkbosstrandDuynfontein end with issues. Over the weekend (after complaining) I was upgraded to a 10Mbps connection. It was better but still not what I would expect. The following is specific to my area, so if your area works, then fine.. I had a Telkom engineer around last week who, would you believe, uses Sonic as his WISP. He also has the same degradation issues as I. Rather sad that he uses Sonic but the explanation was interesting. Basically, anyone who lives North of Pelican Parade is on another copper route for Telkom .It adds extra ?km's to your copper (he said additional 1.5 to your exchange distance, though I cannot guarantee that is the case, would not doubt the guy). If you live South of this then you are on a direct link to the exchange. Even the engineers who live in the area have complained, however very few of the residents have registered an interest. If enough bodies register their intent then fibre (or at worst 10Mbps) could become available, No, I don't work for this mob but 9 years ago I lived at the other end of my street (1km away) and was getting better than this. Just moved back and cannot believe it has got worse since then. Experience with Sonic Wireless so far has been mostly positive and the service has been reliable. We have experienced one minor outage so far possibly related to adverse weather conditions on the day. Sometimes international throughput is a little bit sluggish, but seems to resolve itself in a couple of minutes, but generally browsing remains responsive. For on demand streaming it has worked out very well so far.